The owners of this challenging steep hillside property asked for a finely designed and sited 5000 sq. ft. home. Sky Canyon exemplifies much of the slope work this firm does with hillside design projects. Fitting a building into a hillside with proper solar orientation is an ability that requires visualization, technical design skill, and understanding of positioning and surveying techniques. 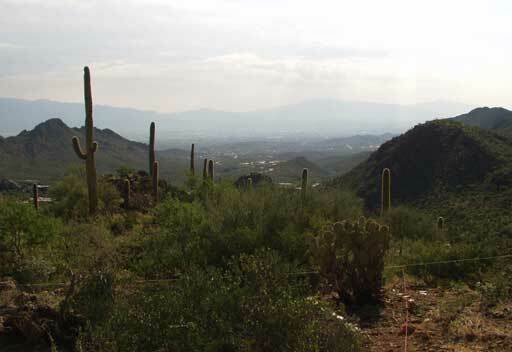 This site is 8 1/2 acres of slopes averaging 45% grade with commanding views of the Tucson Valley. A small 1/2 acre portion of the site with a rugged approach was identified for the home containing a still daunting 23% average cross slope. Adding to the complex scope of the home placement was the desire for a swimming pool and a two-stage sand filter waste disposal system with 300 feet of drip disposal line to site in. To mitigate the steepness of the driveway it was stretched and angled across the contours to soften its approach. The exterior walls were constructed from 10” thick structurally insulated panels (SIPs). The home is heated with a solar sourced radiant floor slab, and the pool is heated with solar coils placed on the roof top. Builder: Wilson Builders, LLC.